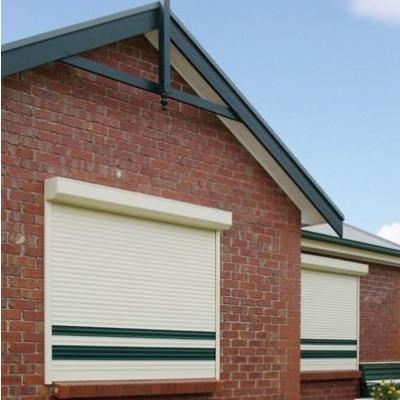 Perfect for providing privacy and protection for your home or business, the Brax range of aluminium Roller Shutters are manufactured from the highest quality aluminium extrusions with a three coat paint process to ensure they stand up to our harsh Australian climate. Available in 11 fashion colours – to suit both traditional and contemporary style homes, all of our Roller shutters are custom made to suit your home or business. Available in a range of operating systems – cord control, internal strap winder, wall switch or remote control, operation is simple and convenient. Security of your home and business is a common reason to think about installing Roller Shutters. By covering the glass, our Roller Shutters make it very difficult for intruders to gain access and can also help to prevent vandalism and broken glass. No more worries about the balls hitting the window either. Roller Shutters also provide excellent insulation properties – reducing summer heat gain by up to 90% and preventing heat loss in winter by up to 70%. This helps you save money on heating and cooling your home all year round. One other feature often overlooked of our Roller Shutters, is that they can provide great insulation against noise – perfect for shift workers needing to sleep through the day. Providing total light blockout when fully closed, or with the ability to be adjusted to allow only the desired amount of light, Roller Shutters can provide protection from damaging UV rays.